This women’s western shirt from Cruel takes all of the western charm and adds to it to make a really unique piece you will love Whether you are riding in the arena, or wearing it with summer shorts, this is a shirt to reflect your fun and feminine style. Nikhaar presents to you this beautiful white, cotton kurti. It has a mandarin collar with a slit neckline and 3/4th sleeves. It also has an embroidered pattern on the front. 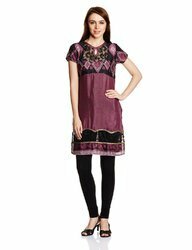 This kurti is best suited for party wear and pairs well with black or green leggings. 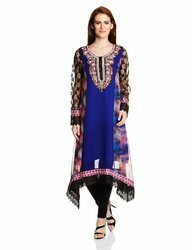 We are a prominent manufacturer, supplier, wholesaler and exporter of Exclusive Cotton Kurti/Tunic/Kurta/Top.Stitched under the supervision of experienced designers, these cotton kurtis enhance the overall look of the wearer. 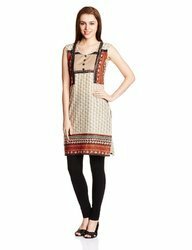 To meet the diverse preferences of patrons, we offer these kurtis in a variety of attractive patterns, designs and sizes.